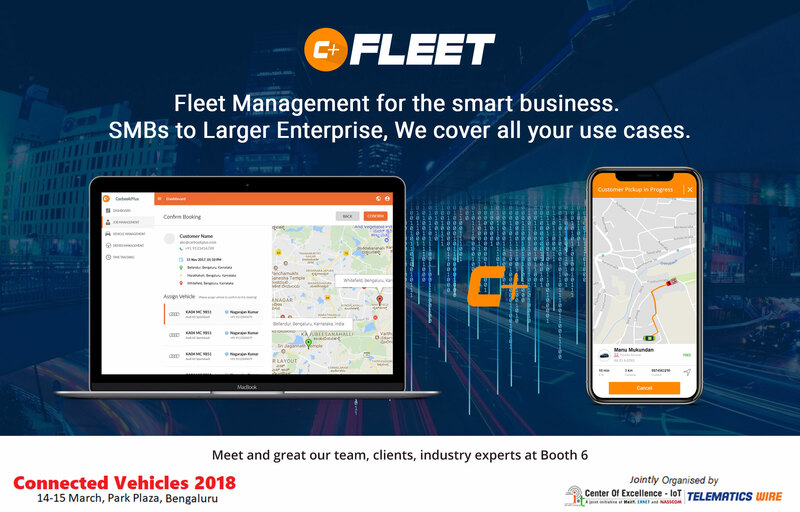 The IT firm CarbookPlus, will be presenting its innovative Fleet Management solution on the 14 and 15 March 2018. The cloud-based platform, with mobile and WebApps, completely digitalizes all the processes, that fleet managers need to oversee: the individual vehicle and driver related data are captured in real time, analyzed, to provide a sum total view of the entire fleet. On 21 and 22 March 2018, the IT firm CarbookPlus will be presenting its innovative IoT platform. The cloud-based platform, with Apps and WebApp, completely automates all the processes, free of charge and independently, that fleet managers need to keep an eye on: It timely captures the relevant data, analyzes it and enables a comprehensive view of individual vehicles or the entire vehicle fleet in real time. Through networked data and services optimization potential can be realized even for smaller and medium-sized fleets. Find out more and meet our team at our booth K41, hall 8a, Messe Düsseldorf. On the 29th and the 30th of November, WidasConcepts will be presenting our IoT platform CarbookPlus – a complete vehicle management solution- to help drivers, vehicle owners, fleet managers, dealers, insurance companies. The All in one Solution for your vehicle related needs. Meet our experts to experience the future of mobility at our stall number 6, Ho Chi Minh City, Vietnam. We look forward to meeting you in Vietnam! For more information contact us. 8. to 12. October, WidasConcepts will be presenting CarbookPlus, a free, independent platform that automates workflows, helps the driver, enabling a complete and time-saving capture of all relevant data. It provides a comprehensive view of one‘s own mobility and vehicle management right up to the entire vehicle fleet. Discover all this and meet our experts at our booth Z-G4, Zabeel Hall 2, World Trade Center, Dubai. The Future of mobility connects cars and drivers! With CarbookPlus you get there! Manage your car related expenses conveniently using CarbookPlus! Keeping in tune with our motto “Change the way you drive” we are happy to announce the enhancements to our mobile App – CarbookPlus. The app that serves as a digital logbook where users can automatically track their trips in real time, find the best fuel station on their way, manage their vehicles all very comfortably and much more. 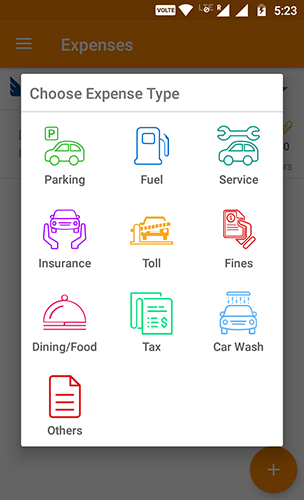 The new “Expenses” feature lets a user easily save and edit his vehicle related expenses. This feature can be accessed from the main menu or the home screen. The expenses are categorized as: Fuel, Parking, Service, Insurance, Toll, Fines, Dining/Food, Tax, Car wash, others. In each case, for a chosen vehicle, the user can either manually enter the costs and related information for e.g. the parking duration, or the amount of fuel etc. OR he can choose to instead click an image of the bill/cost receipt and simply attach it. 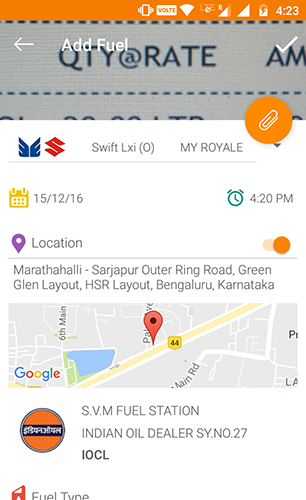 CarbookPlus processes the contents of the bill using OCR and pre-populates the respective fields. It is important to note here that the quality of the image be good and that the bill is not dull/crumpled. All your car related expenses in one place! The following editable parameters are common to all the expense categories: The date and time, location and the total amount. The currency for the amount, by default is selected based on the locale settings of the mobile phone. Additional parameters such as fuel type, cost per liter and quantity (in liters), parking duration are available based on the selected category. By turning the location setting to “ON”, one can select on map and save the address of the fuel station or the parking spot or any other place where the expense incurred. With 1000+ installations already, it is our constant endeavor to deliver the best user experience. Current users please note: you may want to uninstall and reinstall the App to receive the latest updates.